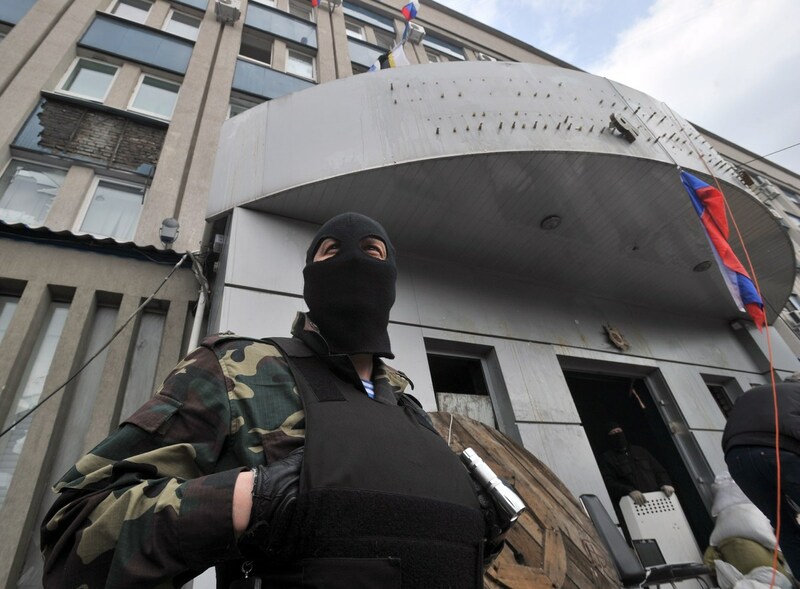 KIEV/MOSCOW, April 22 (Reuters) - Ukraine's acting president Oleksander Turchinov called on Tuesday for government forces to relaunch an offensive against pro-Russian rebels after a local politician from his own party was found dead with signs of torture. Kiev's first push failed last week to retake one of the towns in the mainly Russian-speaking east occupied by the separatists, and its military has largely suspended operations since the United States, Russia, Ukraine and European Union signed a deal in Geneva last week intended to calm the crisis. But the agreement is already in trouble, with Washington and Moscow putting the onus on each other on Tuesday to ensure that it is implemented, including a stipulation that the rebels must disarm and leave the government buildings they have occupied. In an appeal that may complicate European efforts to mediate the crisis, Turchinov said two "brutally tortured" bodies had been found near Slaviansk, the objective of the failed Ukrainian army offensive. One was that of Volodymyr Rybak, a member of Turchinov's Batkivshchyna party, who had recently been abducted by "terrorists", he said in a statement. "These crimes are being carried out with the full support and indulgence of the Russian Federation," he said. "I call on the security agencies to relaunch and carry out effective anti-terrorist measures, with the aim of protecting Ukrainian citizens living in eastern Ukraine from terrorists." Police said the body of a man who had suffered a violent death had been found in a river. It resembled Rybak, a local councillor in the town of Horlivka, near the regional capital of Donetsk, but formal identification would need further work, they added. Batkivshchyna is led by Yulia Tymoshenko, a former prime minister who is running in a presidential election scheduled for May 25. Ukraine's poorly resourced forces had previously shown little sign of taking on the gunmen who started occupying towns and public buildings two weeks ago. Turchinov's call may not lead to much more action but could fuel recriminations between Moscow and Kiev about who is failing to honor the deal. U.S. Vice President Joe Biden told Russia on Tuesday that "time is short" for action on defusing the crisis, but Moscow refused to be rushed, saying it could handle any tougher economic sanctions the West might impose. Speaking on a visit to Kiev, Biden called on Moscow to pull back troops built up on Ukraine's borders and persuade the separatists to disarm. "We've heard a lot from Russian officials in the past few days. But now it's time for Russia to stop talking and start acting," he told a news conference. "We will not allow this to become an open-ended process. Time is short in which to make progress." The United States has repeatedly warned Russia it faces "mounting costs" if it fails to ensure full implementation of the Geneva agreement. But the Russian ambassador to the United Nations, Vitaly Churkin, ruled out rapid progress. "Of course, it would be naive to suppose that all this could happen quickly," Churkin said in an interview on Rossiya-24 television. Russia's annexation of Crimea from Ukraine and the eastern rebellion have deepened the worst East-West crisis since the Cold War, and Biden demanded the removal of Russian forces near Ukraine's frontier which Moscow insists are merely on exercises. "No nation should threaten its neighbours by amassing troops along the border. We call on Russia to pull these forces," Biden said after meeting Ukrainian Prime Minister Arseny Yatseniuk. Russian Foreign Minister Sergei Lavrov responded by telling U.S. Secretary of State John Kerry in a telephone call that Ukraine itself should take urgent steps to implement the Geneva accord, his ministry said in Moscow. The United States and NATO have made clear they will not intervene militarily in Ukraine, which is not a NATO member. However, the Pentagon said on Tuesday that it was sending about 600 soldiers to Poland and the three Baltic states for infantry exercises, to reassure NATO allies about U.S. commitments to them following events in Ukraine. Moscow denies it is orchestrating the militants, who say they want the chance to join Crimea in becoming part of Russia following the overthrow of Moscow-backed president Viktor Yanukovich after months of street protests in Kiev. But Washington has said it would decide "in days" on additional sanctions if Russia does not take steps to implement the agreement. In Moscow, Prime Minister Dmitry Medvedev promised the country could deal with tougher measures if necessary. "We shan't give up on cooperation with foreign companies, including from Western countries, but we will be ready for unfriendly steps," he told parliament. "I am sure we can minimize their impact," he said. "We will not allow our citizens to become hostages of political games." So far the United States and EU have imposed visa bans and asset freezes on only a limited number of Russians over the annexation of Crimea last month. The chief mediator for Europe's OSCE security body in eastern Ukraine met separatist leaders occupying buildings in Donetsk on Tuesday. He called their talks "constructive" but gave no indication they would leave. In Brussels, EU diplomats said the bloc was holding off from imposing further sanctions until it sees whether the Geneva deal works. The EU has been more cautious than the United States in imposing sanctions on Russia, with some member states worried about antagonizing a country that supplies a third of Europe's gas. Both sides stressed on Tuesday they wanted to depend less on the other over energy. Medvedev said Russia was more interested than ever in diversifying its gas exports and described talk of Europe importing U.S. gas as a substitute as "a bluff". Partly as a result of the Ukraine crisis, the EU is stitching together measures such as raising electricity production from coal and renewables. Russia's top natural gas producer Gazprom, however, maintained Europe still needed its supplies. According to most scenarios, long-term gas demand would increase in the European market while production there would decline, it said in a statement issued after a board meeting. Reuters calculations suggest that the EU steps could slash imports from Russia by around 45 billion cubic metres by 2020, worth $18 billion a year, or the equivalent of a quarter of what Russia currently supplies. During Biden's trip, the United States offered Ukraine a new $50 million aid package to help with economic and political reform. Of this $11.4 million was earmarked for helping with the election to choose a successor to Yanukovich, the White House said in a statement. While small in relation to Ukraine's huge needs and a $1 billion loan guarantee already signed with Washington, the package serves to show support for the new authorities following the overthrow of the Kremlin-backed Yanukovich in February.